Twenty die-cut labesl from America's greatest trains and railroad lines. In some sense the history of the railroad in the United States is a history of 19th and 20th century America. The railroad joined one coast to another, bridged the gap between rural and urban, and moved goods and people at a high rate of speed. Travel labels were created around the middle of the 19th century, to identify trunks on ocean liners and direct them to their staterooms. Eventually the custom expanded to trains, hotels and eventually airplanes, and travel companies realized the labels' marketing potential. Travel labels are widely collected both for their design and historical interest. 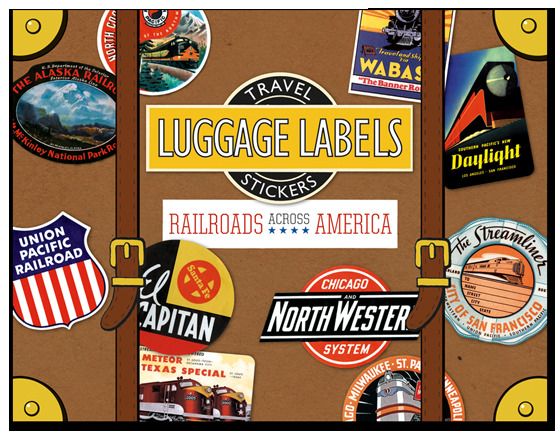 Our Railroads Across America Labels Box contains twenty die-cut labels from railroad lines both familiar, such as The Santa Fe, New York Central, Burlington and Union Pacific, and lesser-known lines like The Southern, Wabash, Frisco and Maine Central. We have also included labels from beautiful individual trains with such evocative names as The Zephyr, Hiawatha and The Streamliner.